Keep asking yourself what metering mode to use? Discover how to master metering to get perfectly exposed images in every situation. Here, with some help from our friends at the Canon magazine PhotoPlus, we show you what metering mode to use on your Canon DSLR. But even if you shoot with a different brand, many of the same principles still apply. Taking a photo is often referred to as 'making an exposure'. This is because when you press the camera's shutter release button the mirror that reflects the image into the viewfinder flips up out of the way, allowing the imaging sensor to be exposed to light. Another sensor inside the camera, called the metering sensor, is central to this whole operation: it measures the light that's coming through the lens and determines how much is needed to produce a well-exposed photo. Of course, you can let your camera do everything and hope it produces the goods - and much of the time it will. However, you'll often be able to improve things if you get involved in the process, and the first step is to choose the metering mode the camera uses to measure the light. The majority of Canon EOS cameras have four metering modes: Spot, Partial, Centre-weighted Average and Evaluative, all of which work in the same way. As light is reflected from a scene or subject through the lens, it hits the mirror in front of the imaging sensor and is reflected up to the camera's focusing screen and metering sensor. However, each of these modes takes an exposure reading from a progressively larger part of the frame. As the name suggests, Spot metering offers the most precise metering - anywhere from 1.5%-10% of the total picture area, depending on the camera - while at the other end of the scale, Evaluative metering takes a series of readings in zones that cover the entire frame. Since the launch of the EOS 7D in 2009, Canon has used a 63-zone iFCL (intelligent Focus, Colour and Luminance) metering sensor in almost all of its EOS cameras (the exceptions being the 1-series bodies and the EOS-M). In Evaluative mode, this sensor not only measures the brightness of a scene across all 63 zones, but takes into account colours and which parts of the scene are in focus. The camera then uses a metering algorithm to determine the combination of aperture, shutter speed and ISO required to make an exposure - and it does all of this in a fraction of a second, before you fully press the shutter release to take the shot. There is one problem with this system. Camera meters are traditionally calibrated around the amount of light reflected by a midtone subject. Point your lens at a midtone scene or subject, such as rolling green landscape or grey stone church, and there's no problem - the meter can be relied on to give good results. However, if you're taking a shot of a snowy landscape, or a swan flying across a pale sky, the image is likely to come out too dark, or underexposed. This is because the meter interprets a bright subject as being a midtone subject that's receiving too much light, and as a result it reduces the exposure - that's why ice-white snow can be recorded as pale grey. The reverse is true of a subject that's darker than midtone. The meter sees this as midtone subject that isn't receiving enough light, so it increases the exposure in order to brighten things up. The result is an overexposed picture - black cats appear dark grey and night skies look washed out. 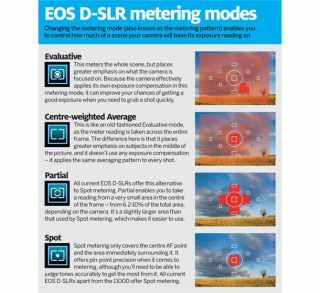 All Canon metering modes in any EOS DSLR work on this principle, but Evaluative is an 'intelligent' option that analyses a scene and determines whether the sensor needs to capture more or less light to produce a balanced exposure. That's the theory, anyway, and while Evaluative mode copes well when there's plenty of light, it can struggle when light levels drop, when a subject is very small in the frame or when backgrounds are very bright or dark. It also uses the AF points in its exposure calculations, giving more emphasis to the point that has achieved focus as well as factoring in those that are almost in focus, and this can cause unexpected results if you lock the focus on a very bright or a very dark subject; the rest of the picture might be underexposed or overexposed as a result. To fix this you can use your camera's exposure compensation feature - you'll need to be in one of the Creative Zone exposure modes, such as Aperture Priority or Shutter Priority, to access it. Exposure compensation enables you to override the metered exposure setting to make a shot brighter or darker than the camera thinks it should be, whether this is to correct an underexposed or overexposed shot, or for creative effect. You can dial in up to +/-5 stops of exposure compensation, and even combine it with Auto Exposure Bracketing to shoot a sequence of pictures at different exposure levels. There are no set rules about how much exposure compensation will be right for a given situation, so review an image after you've taken it, check the histogram and adjust the compensation as required. If you shoot Raw files, you can tweak the exposure of a picture later in Raw conversion software such as Adobe Camera Raw or Canon Digital Photo Professional. However, it's much better to get an exposure right when you take the shot. Trying to rescue detail in an underexposed shot can exacerbate noise in shadow areas, particularly with images shot at high ISOs, so get it right in-camera for cleaner, detail-rich results.